Some NBA fans might not know this but the Oklahoma City Thunder have been in the league since 1967. The team started as the Seattle SuperSonics until they relocated in Oklahoma City in 2008. As respect to the fans of the Sonics and the people of Seattle, this list will not include players of the original. We are just going to focus on players during the Thunder Era. In ten seasons in Oklahoma City, the Thunder have only missed the playoffs twice in their first year and in 2015. The Thunder already had Kevin Durant during their inaugural season in Oklahoma City and the front office built a great team around him. The Thunder drafted Russell Westbrook and Serge Ibaka in 2008, James Harden in 2009, and Steven Adams in 2013. The team advanced to the NBA Finals in 2012 but fell to the Miami Heat in five games. They were also one win away from another NBA Finals in 2016 but they collapsed against the Golden State Warriors. Durant was a free agent that summer and joined the Warriors. Now, the Thunder has a team consisting of Westbrook and Paul George. So, without further ado, here are the all-time starting five for the Oklahoma City Thunder. Selected 12th overall in the 2013 NBA Draft, Steven Adams developed into one of the best big men in the NBA today. Adams has improved every season and he has been an enforcer down low for the Thunder. In his sixth season in the NBA, he is posting career highs in points, rebounds, assists, and steals. 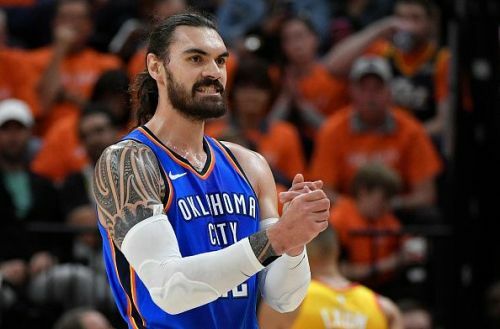 Adams also has taken a larger role in the Thunder’s offense, being the third option behind Russell Westbrook and Paul George. He has also become a fan favorite in Oklahoma City and if he stays loyal to the Thunder, his No. 12 jersey will surely get retired by the Thunder once his playing career is over. Due to the short timeline of the Thunder’s existence in Oklahoma City, Enes Kanter gets the nod as an honorable mention at center. Kanter was acquired at the 2015 NBA Trade Deadline from the Utah Jazz. 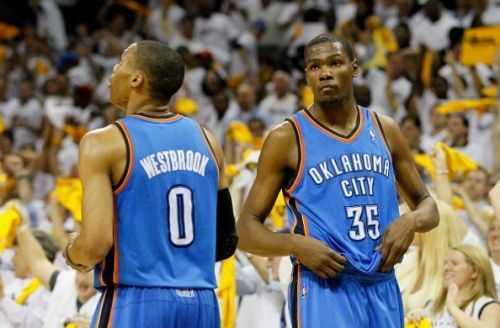 He spent two and a half seasons in Oklahoma City wherein he became one of the best sixth men in the league.